This is my first time posting; so if I did not do it right, please let me know how to post. 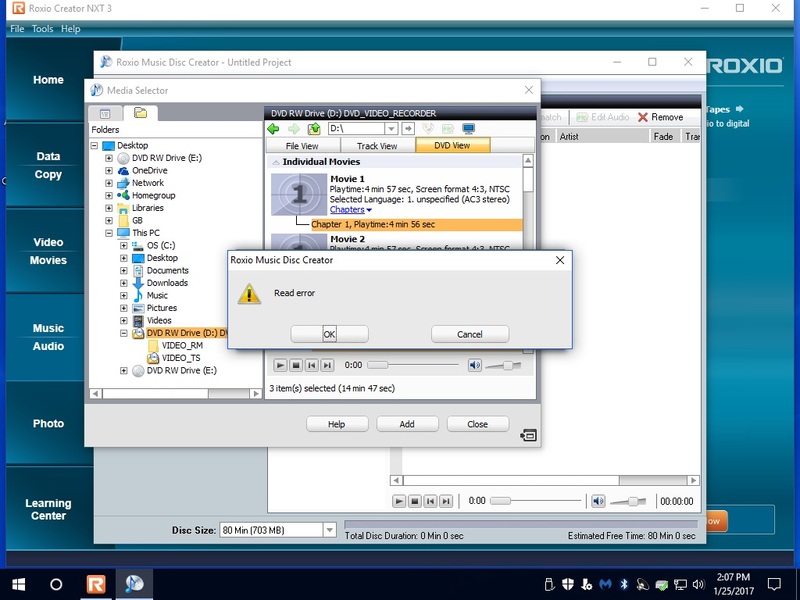 My NXT3 no longer extracts audio from video. It loads the video, I highlight the clip to extract from but the next step is SAVE and it gives a Read Error and cannot continue. Please note that these are not copy protected videos. I have done several clean installs as per instructions with no luck. Support suggest to go with a newer version but I do not know if I would have the same problem. I would appreciate any suggestions. Thanks. I have no problem extracting the audio from a video clip with NXT 3. Does the audio play when you play the clip in Videowave? I click on Music Audio, Create Music Project, Audio CD, Import from CD/DVD. Media selector brings up the videos. I click on Chapter, it expands; highlight the chapter, Click ADD, it starts working and the SAVE window appear, click on SAVE. This is where it gives the READ ERROR. To answer your question, yes it plays fine in the Video Wave Editor. It also plays fine while in the Media Selector preview. Another point, yesterday I purchased Roxio RecordNow Music Lab 10 Premier because it claims to extract audio from video. It also goes through the above steps and it gives the Read Error. Also, I tried some of the free programs and they extract fine but they are limited. If this paragraph introduces confusion, please ignore it. My system has windows 10-64. A while back after windows updated to 10, it quit extracting but after a clean install, it worked again until now. Is there anything more to the error message beside, "Read Error"? Is that the full content of the error message? If not, please give us the full error message exactly as it's shown. No, only the Read Error. So, the message box that comes up says this exactly, "Read Error"? There's nothing more to the message? Actually, if you captured a screen shot of the message and attached that, it would let us see it for ourselves. Instructions for posting an image can be found in the first link in my signature, below. But if all it says is, "Read Error", that isn't overly helpful. Here is a screen shot of the Read Error. I would not use the Music Disc Creator to extract audio from a DVD but prefer to use Videowave. In Videowave, add the Video_TS folder and then right-click the video in the timeline to bring up the drop-down menu from which you select "extract audio". This allows you to create an audio file which you can play to see if it is good. You can also copy the Video_TS folder from the DVD to your hard drive and then use that folder for extraction. You then don't need the DVD anymore. Yes! this is going to work. It went through the process smoothly up to the point of saving the file. I stopped there until I get familiar with the next step of editing the audio that was extracted here. I have never extracted from here. But the stumbling block is out of the way thanks to your advice. Please receive my gratitude for sharing your time and knowledge with us.